The two different approaches to the Maturity Ladder deliver two quite distinct investment outcomes. The first approach gives investors a way to use fixed-rate bonds to their advantage in a rising rate world. To make it work investors must roll the ladder forward by reinvesting in longer-dated bonds, as each bond matures. In the second approach the investor has decided they want a fixed-period of known principal repayment and income. This approach isn’t about views on interest rates or taking advantage of rising rates. The investor consumes the principal and income along the way. 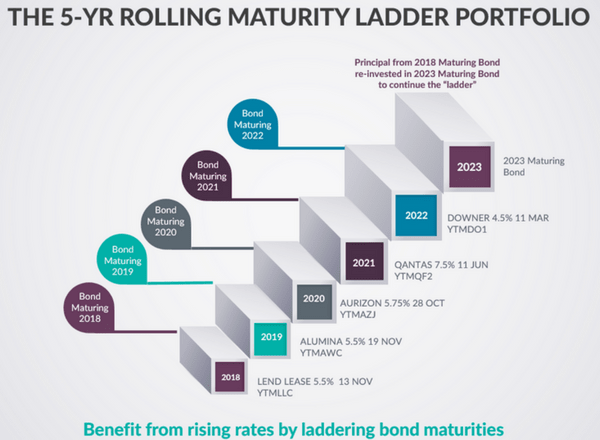 Taking advantage of rising rates may become the dominant use of the Maturity Ladder approach, particularly if Australia heads into a period of rising rates. The ASX’s RBA Rate Indicator, provides a chart of the future cash rate implied by 30-Day Interbank Cash Rate futures trading on ASX out to March 2019. This is not a forecast by ASX, it’s simply showing what cash rate is ‘implied’ by current trading in the relevant futures contracts. While market sentiment is dynamic, today this chart has a 25bps increase in rates priced in by November 2018. The chart may change at any time, but a rate increase around then is supported by many market commentators. If we assume the perspective of an investor who thinks rates will rise over the next five years – their first reaction may be that fixed-rate bonds are off the menu. If fixed-rate bonds were out of fashion every time economies went into a rising rate world, then the 300+ year old global market in fixed-rate bonds would surely have shut down many years ago. Of course that’s not the case. Instead, experienced investors have simply made use of the fact that bonds mature, and when they do, investors get the principal of the bond back. It doesn’t matter whether rates have gone up or down – $100 principal is $100 principal. It is bond ‘market’ prices that are impacted by rate changes or expectations of rate changes. If investors establish a bond portfolio in such a way that they’re receiving regular repayments of principal, then they can re-invest this into bonds with higher yields. The market prices of these bonds become cheaper and cheaper as rates rise. That way investors use the maturity feature of bonds to their advantage. This is the essence of the Maturity Ladder approach to using bonds when rates rise. Therefore the increase is not already factored into bond prices; the increase should translate into a 25bps increase in XTB yields. What happens in September 2018? All the above XTB market prices should fall, because they’re all fixed-rate XTBs. The Downer 2022s are the longest dated, so should fall the most. They’re now a 4-year XTB and longer duration bonds are more sensitive to rate rises. The Lend Lease bond actually matures in November 2018 with only 2 months to maturity. Duration is the rate of change of a bond price with respect to yield changes. Our assumption was the cash rate change caused all bond yields to increase by 25bps. To keep things simple, if we say the duration of the Downer XTB is numerically equal to its term of 4, then in theory its price should fall by 4 times the yield change of 0.25% or 1%. The Qantas bond price should fall by 3 times 0.25%, or 0.75% and so on. The Lend Lease bond matures in 2 months, so in theory its price might fall by 2/12, or 0.16 times 0.25%, which is 0.04%, or basically not much at all. And why should the price fall much? Lend Lease is about to pay back the $100 principal, and the rate rise has nothing to do with the principal amount Lend Lease has to repay. Using the ladder approach in this way, investors must hold the bonds to maturity – otherwise the entire approach doesn’t work. It doesn’t actually matter what happens to the Lend Lease XTB market price, as it’s about to become $100 principal plus the last coupon. What does matter to the strategy is what happens to the price of the 2023 bond about to be rolled into the ladder portfolio. The 2023 XTB will be a 5-year XTB at that point, so its price should be 5 times 0.25%, or 1.25% cheaper than it was before the rate rise. Overall, the portfolio will enjoy a higher yield, as a result of adding the new bond. In 2019 the process is repeated until the investor decides to stop rolling the ladder. Investors are basically swapping the fixed principal at maturity, for XTBs at lower market prices, if the rate rise cycle continues. Rate rises may just have become your friend. Credit risk – Investors are in effect lending to a company (this article is assuming you’re sticking with higher rated bonds of ASX 100 companies). Investors must hold to maturity. Any XTBs they sell on market will have been impacted by the rate changes. That’s how investors can use fixed-rate bonds in a rising rate world. Now, what about the ladder approach as a basic capital preservation and cash flow management strategy for a fixed period of time? In ths approach, rather than rolling maturing XTBs when principal is returned, the investor consumes both the principal and income throughout the period the ladder is in place. The rationale for this approach is to lock in a fixed period of time where the investor receives a blend of both income and principal, which is 100% predictable before they invest. Who is this approach suitable for? As an example, it might be used by an investor who is not working anymore, with a sum of capital to live off, but a superannuation which only kicks in in five years. Alternatively, a retired investor might predominantly be invested in shares and live entirely off his dividend income. But he’s worried the equity market might be in for a 5 year significant set-back, for both prices and more importantly dividends. There are so many older Australians in the latter camp. They have 90% plus of their investments in equities, with some cash for a rainy day. Their fear is that if equities crash they’ll burn through their cash and dividends will be cut, leaving them with some harsh lifestyle choices. In both these cases, the Maturity Ladder provides a solution. In the first case, investors could just spend their lump sum over the next five years until their Super kicks in, but that means they didn’t generate any income from it. The Maturity Ladder is a step above ‘just spend it’, because they’re investing the capital sum at the yields delivered by the 5 XTBs. In each year they receive the principal plus some income. At the end of the five years when their Super starts delivering, they’ve still spent all the money, but at least they had the original sum plus the yield the bonds delivered. This is an improvement on just spending the cash. Rightly or wrongly, the second case is much more commonplace after 30-plus years of the national love affair between Australians and their shares. If Vanguard’s John Bogle said we should all own our age in bonds (invest in lower risk assets as you age), then Australians must have mistaken that for shares, or property. 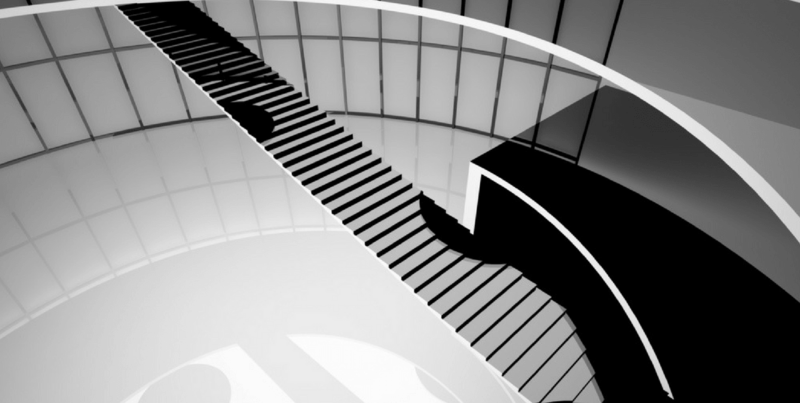 It was the late John O’Connell, the CIO of Macquarie Bank’s Banking and Financial Services Group who first drew our attention to this use for the Maturity Ladder. John was ever the visionary. His vision on this front was retirees putting a 5 or 7 year bond or XTB Maturity Ladder at the heart of their otherwise equity dominated investments. The investor could keep the ladder rolling when equities were flat or growing. In this benign world, the XTBs were simply another source of income alongside the investor’s mainstay – dividends. If a dreaded equities crash eventuated and share prices plummeted and dividends were slashed, then rather than selling shares to fund lifestyles, the investor would switch to consuming both the principal and the income from the ladder. This would give him 5 or 7 years of the stable, predictable cash flows from their portfolio of XTBs. By the time he’s consumed the ladder, the equity market and dividends should hopefully have recovered. Bonds at the heart of an equity portfolio are really just basic asset allocation for global Super and Pension funds. Note: When investors consume the principal and income along the way, the approach isn’t about views on rates and taking advantage of rate rises. They are not buying cheaper bonds with principal. This approach is about capital preservation and income predictability, although of course the principal and income received will not be impacted by changes in rates. The Maturity Ladder approach is a powerful one with a number of applications for different types of investors. You do need to hold the bonds to maturity, so you can’t replicate this strategy in funds or ETFs because they’re perpetual trusts where you lose the benefit of maturity. Read more on the Maturity Ladder Portfolio. Investors looking for a rolling portfolio should invest in the portfolio as published. Then check back in 2018 before your first XTB matures (the Lend Lease 2018s) to see which longer-dated XTB CIO Ian Martin recommends to roll into. Investors who want the Maturity Ladder portfolio to consume the principal and income over a five year period can buy the portfolio as featured in our Cash Flow Tool today and hold it all to maturity. And remember as always – Keep Calm and Carry Bonds.